Apple will be deeply integrating Twitter across iOS 5, the next major version of its OS for the iPhone, iPad and iPod touch. 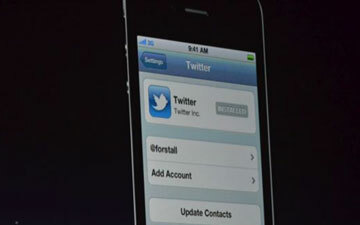 Twitter integration was one of the rumored announcements leading up to WWDC, and Apple has delivered. Users can associate a Twitter account in the iOS settings and other apps will automatically gain access to Twitter integration using the app, which means users no longer have to log in or manually add an account each time. Moreover, apps like Mail, Contacts, YouTube and Camera will all have extensive levels of Twitter integration.